Please refer to our stock # 2058 when inquiring. Ancient Nazca Textile Camelid Tunic, Peru circa 100 - 700 CE. Pigments of red, blue, brown and cream, and repeating geometric patterns. Some wear and fading due to age and use, but otherwise in good condition for a textile of this period. Attached to silk backing. 22" H x 21" W. The Nazca are also known for their technically complex textiles. The textiles were most likely woven by women at habitation sites from spun cotton and wool. The textiles would have been made using a backstrap loom. This is similar to the way textiles are made in the region today. Textiles were woven with the common motifs earlier than they appeared painted on pottery. 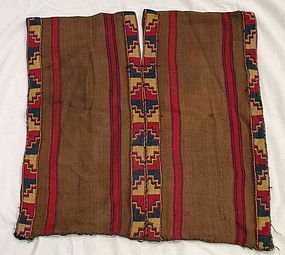 The dry desert has preserved the textiles of both the Nazca and Paracas cultures, which comprise most of what is known about early textiles in the region.